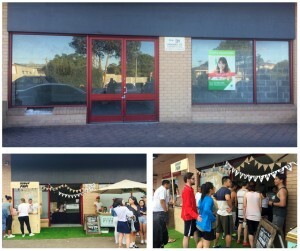 Recently an opportunity arose where we could turn an empty space into a pop up store to showcase young up and coming retailers at the recent Moon Festival in Cabramatta. We converted a bare shell of a store into a vibrant light filled hub for some of Sydney’s best new talent. We had Donut Papi, Merry Pops and Buttercream & Belle set up their stalls in a garden themed location from 11am – 6pm where over 1,000 donuts, ice creams & cupcakes were sold. We saw an increase of over 30% in pedestrian traffic to our centre for the day and it left the customers wanting more.